The confusion of battle that makes ally kill ally. One example is the tale of Fergus Mac Leda and the sea monster Muirdris at Loch Rudraige. After Fergus gains the ability to breath water from capturing water sprites he travels to see the beast and violates a geas laid on him by the sprite. The beast is so horrific to behold his face is frozen in shock, a condition that by rights should deny him the kingship of Ulster. His subjects like him so much they prevent him from seeing his reflection until one day an angry serving girl blurts the truth. Ashamed, Fergus seeks Muirdris to slay it with an enchanted sword named Caladbolg. He does so, dying of exhaustion after a fierce battle that turns the water red with their blood. Spectres (airdrech) are known to the Irish stories. Finn Mac Cumaill encounters phantoms on the road that try to offer him horsemeat on rowan skewers and that beat him and his friends when he refuses. Cu Chullain faces a horrific spectre as a boy when the noise of a nearby battle wakes him and he looks for Conchobar, his king. He finds his king wounded in a ditch who asks why he is here when he could die from fright on the battlefield at night. The word is also used to describe female valley bandits whose piercing shrieks and martial arts unusually get the better of Cu Chullain until Laeg his charioteer taunts him. Well then, Cú Chulainn’, said Laeg, ‘doomed coward, one-eyed sprite, your fury and your valour have gone since it is spectres that ruin you’. This awakens Cu Chullain's battle-fury and he predictably goes on to tear them a new one. The description of bandits and other night-folk as 'supernatural' or dreaded is congruent with the desperate fear they inspired as they would not observe the laws of hospitality that most Irish honoured. This continued even into the rise of Irish Christianity and the story of Saint Moling who escapes from a family of particularly foul fúath. Shapeshifting hags and warriors are notable, the loathsome hag promising riches to those showing it affection is a known Celtic trope. The warrior is less so, Úath mac Imomain (terror, son of great fear) lives under a loch and challenges three heroes to a beheading contest in the Feast of Bricriu prescient of Gawain and the Green Knight. Of these heroes, only Cu Chullain will stick his neck out to receive the reply. This exemplifies the value that the Irish place on courage and honour. Finally the horror brought about by the confusion of war is described as a terror. During the Tain bo Cuilange when the hosts of Medb appear, Cu Chullain raises a war shout answered by the goddess Nemain and by the spirits and goblins of the glen. The resulting confusion causes the army to panic blindly and lose a hundred warriors. Though it may seem like exaggeration, histories of war are full of examples where confusion in the ranks has led to allies attacking each other. The Irish tell a mean story and their ghost stories are no exception. 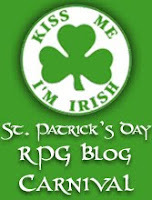 Many of the classic tropes found in RPGs have a bit of Irish in them and if you're looking for inspiration, you could do worse.